WINDSOR, Conn., Oct. 11, 2018 /PRNewswire/ -- The gross return of the SS&C GlobeOp Hedge Fund Performance Index September 2018 measured 0.62%. 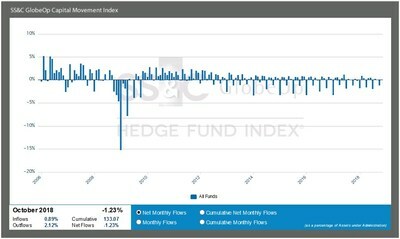 Hedge fund flows as measured by the SS&C GlobeOp Capital Movement Index declined 1.23% in October. "SS&C GlobeOp's Capital Movement Index for October 2018 of -1.23% reflects net outflows that are consistent with normal seasonality. In fact, the -1.23% reported for October 2018 is almost identical to the -1.21% reported for the same period a year ago for October 2017," said Bill Stone, Chairman and Chief Executive Officer, SS&C Technologies. "This result indicates stable investor allocations to hedge funds, despite volatile equity markets and increased interest rates." 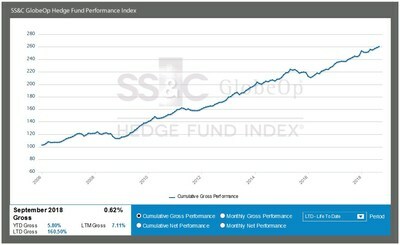 The SS&C GlobeOp Hedge Fund Performance Index offers a unique reflection of the return on capital invested in funds. It does not overstate exposure to, or the contribution of, any single strategy to aggregate hedge fund performance. Since its inception, the correlation of the SS&C GlobeOp Performance Index to many popular equity market indices has been approximately 25% to 30%. This is substantially lower than the equivalent correlation of other widely followed hedge fund performance indices. The SS&C GlobeOp Capital Movement Index represents the monthly net of hedge fund subscriptions and redemptions administered by SS&C GlobeOp on the SS&C GlobeOp platform. This monthly net is divided by the total assets under administration (AuA) for fund administration clients on the SS&C GlobeOp platform. Cumulatively, the SS&C GlobeOp Capital Movement Index for October 2018 stands at 133.07 points, a decrease of 1.23 points over September 2018. The Index has declined 3.92 points over the past 12 months. The next publication date is November 13, 2018. Published on the ninth business day of each month, the SS&C GlobeOp Capital Movement Index presents a timely and accurate view of investments in hedge funds on the SS&C GlobeOp administration platform. Data is based on actual subscriptions and redemptions independently calculated and confirmed from real capital movements, and published only a few business days after they occur. Following the month of its release, the Index may be updated for capital movements that occurred after the fifth business day.